CONMEBOL have confirmed that the delayed Copa Libertadores final between Boca Juniors and River Plate will take place in Spain, at Real Madrid's stadium. 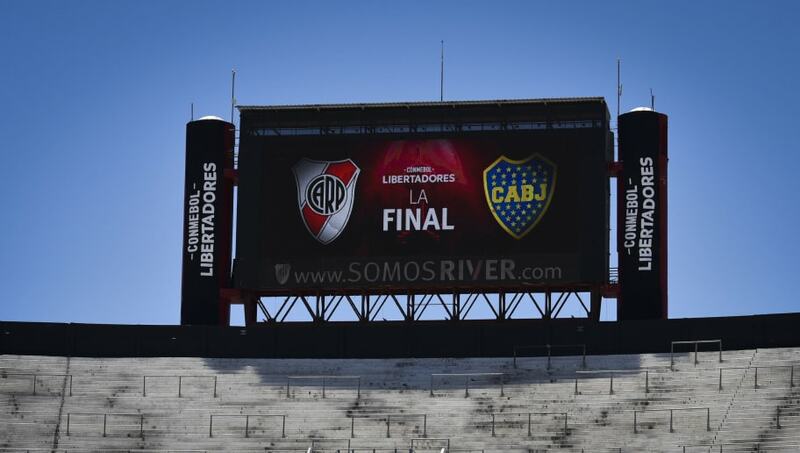 The second leg of the final between River Plate and Boca Juniors was scheduled to take place Saturday 24 November at El Monumental in Buenos Aires, but the game was postponed after Boca players and staff were injured in an attack on their team bus. It was announced on Tuesday that the game would take place on the weekend of 8-9 December outside of Argentina. Several possible venues had been touted and subsequently ruled out, including Miami, Doha and Asuncion. Spanish President Pedro Sanchez confirmed via ​Twitter that the final will take place in Spain, although he did not name a specific venue – with CONMEBOL later confirming the final choice. Earlier on Thursday, ​AS reported that there was a '90%' likelihood of the final taking place at the Bernabeu after FIFA contacted the Spanish Football Federation to help them out. It was reported that both clubs had agreed to play the final in Madrid, despite Boca previously saying that they would boycott the final until the trophy was awarded to them. The Bernabeu was always likely to be the host venue if a Spanish move was confirmed, as the Catalan derby match between Espanyol and ​Barcelona will be taking place in the city that weekend.